Culturing dairy products adds enzymes and provides probiotic benefits. This is an especially helpful process when using pasteurized milk, where the original enzymes and living biota have been cooked out. Use raw or pasteurized (but not ultra-pasteurized) cow or goat’s milk. If using PASTEURIZED milk: Gently bring two quarts of milk up 180°F/82°C in a saucepot. (If you cook it too fast, you’ll burn some on the bottom of the pot). 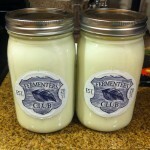 If using RAW milk: Gently bring two quarts of milk up 110°F/43°C in a saucepot. Higher temperatures will kill the valuable enzymes and living bacteria present in the milk! Add one tablespoon each of yogurt from a previous batch to two clean 1-quart mason jars. As soon as the milk reaches temperature, remove from heat. 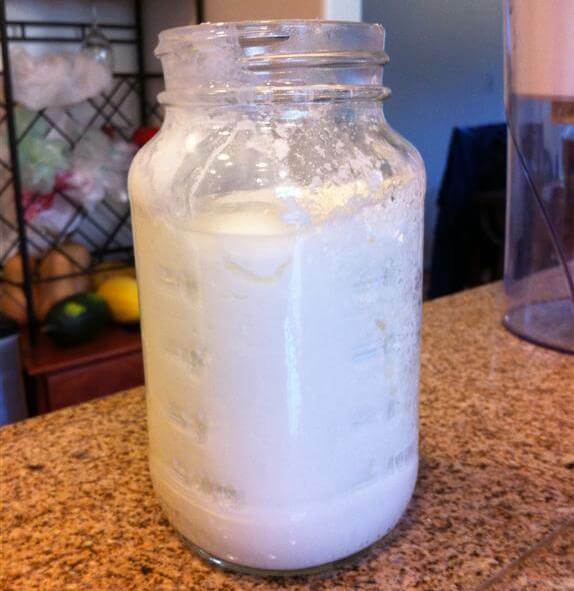 (Skip this step if using raw milk). Cool down the milk to 110°F/43°C. To speed up the cool down, fill a large bowl with water and ice, and carefully submerge the pot, being careful not to mix water in the milk. 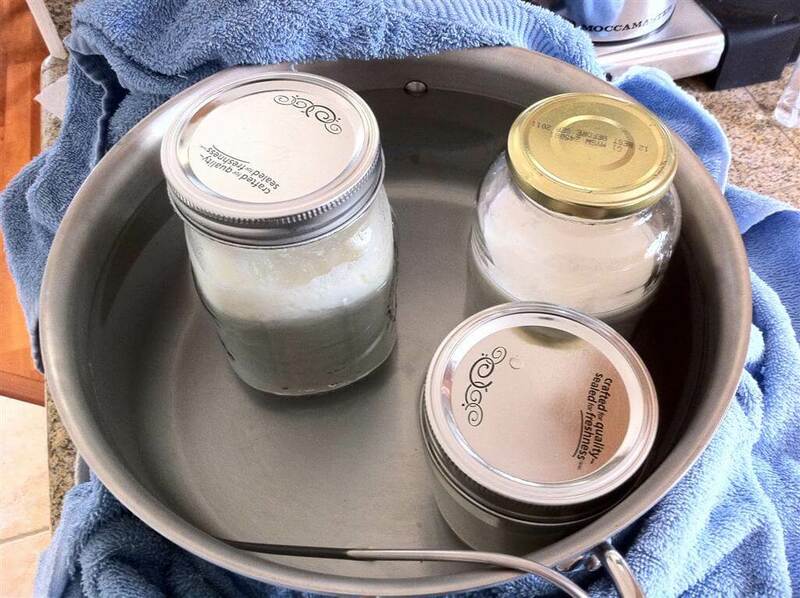 Once the milk has cooled, divide the milk into the two mason jars. Mix well to incorporate the starter. 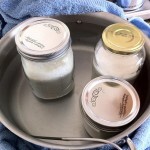 Seal the jars with the metal lids and rings. METHOD 1: Water bath. Fill a cooler with enough hot water to cover the jars. Submerge jars under the water. 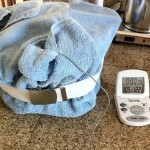 (Optional) We inserted a probe thermometer to keep an eye on the temperature (see pics below). METHOD 2: Warm oven. Preheat an oven to 200°F. Turn it off as soon as it reaches temperature. Place jars onto center oven rack. Do not disturb the jars once you’ve placed them. This will help the yogurt form its consistency. 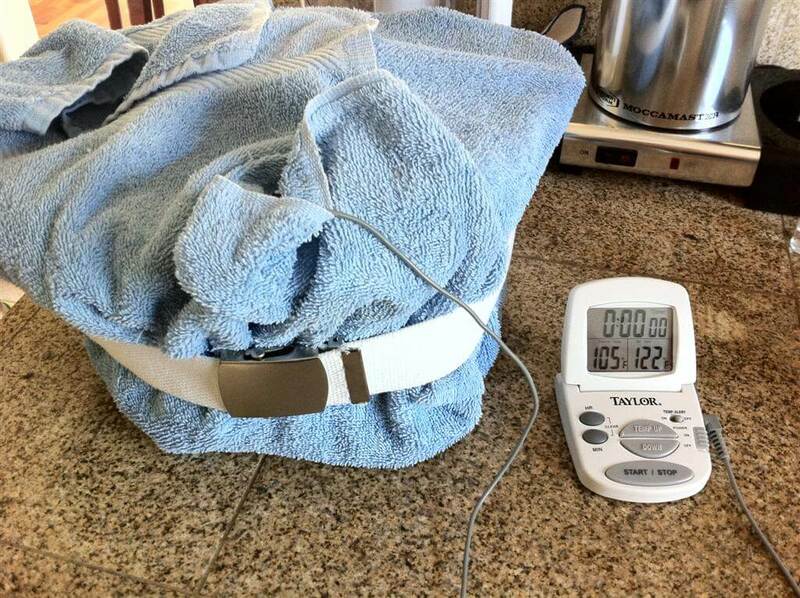 METHOD 1: Add near-boiling water to the cooler to get the temperature back up to the desired range. METHOD 2: Turn the oven back on to 200°F for just 5 minutes. Turn it off after 5 minutes even if it has not reached temperature. After eight hours, remove from incubator. Refrigerate and keep up to one month. 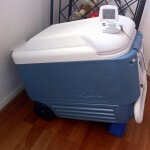 If the yogurt isn’t thick after 8 hours, refill the cooler with warm water to bring the temperature back to 110°F/43°C. Let it sit for another 4 hours. With several batches I made, there was an acidic sour taste and an effervescence in the finished product. This was due to using too much starter. More is not always better! 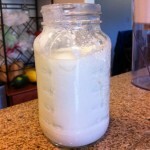 Finished yogurt– ready for the fridge! Love this! I have a big batch of nice ‘n tart yogurt in my fridge right now. 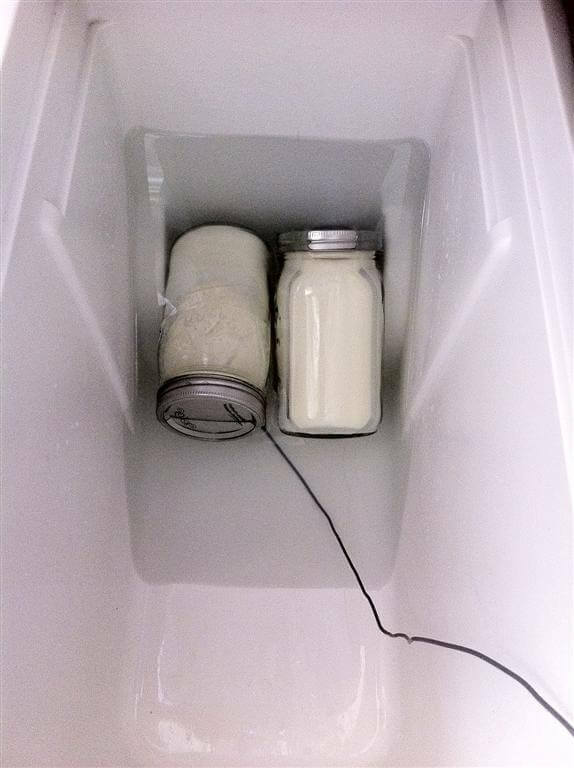 By the way, I don’t have a separate incubator, so I use the oven: I heat the oven to 200 degrees, then turn it off and immediately put in my covered glass jar of yogurt-to-be…. I don’t open the oven until 5-6 hours later when the yogurt is likely to be set. 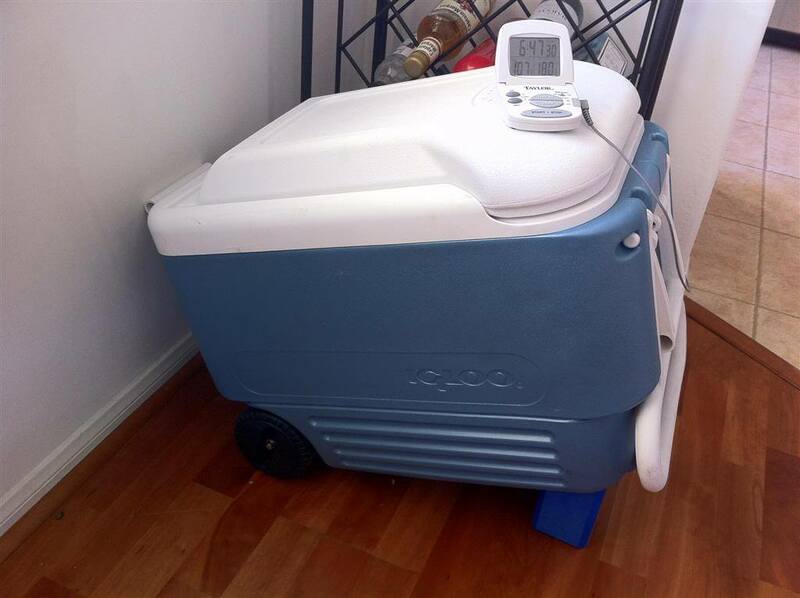 I like that method– even easier than lugging the cooler out. I’ll try that next time. I would like to do a 24 hour yogurt. Any suggestions on that. I like the oven method. Another commenter just recommended a 24-hour recipe to remove the lactose. I think you would just need to keep the temperature around 100, so fire up the oven to 200F for 5 minutes every 4 hours or so, or right before you go to bed. If you leave the oven door closed, the heat should stay in nicely. Let us know how it turns out. Thanks! Hi! Wanted to add some information for anyone who might be lactose intolerant or want to be sure all the milk sugars are gone from the milk. 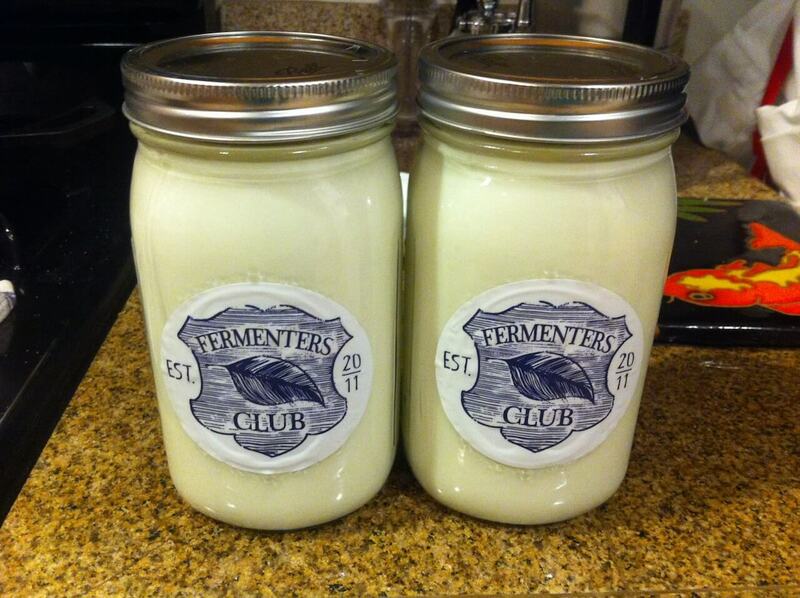 (this allows for many who do not tolerate regular milk to tolerate yogurt!) it also makes for a delightful tangy yogurt. Thanks Gianna. Great tip for lactose-intolerant folks who still want the benefits of yogurt! It was my job to make yogurt starter for Safeway Stores, in Los Angeles. 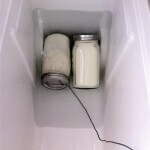 We pasteurized the milk, then cooled it to 110 degrees F, then only 2% starter was added. In four hours time, the yogurt should be at about ready to eat. We agitated the yogurt and cooled it down to retain the tart flavor. If you see whey on top of the yogurt, it fermented too long. The whey is the watery looking substance on top. Yep, whey means it’s overdone. Thanks for sharing your yogurt story!